Date of Entrance Exam: 7th May 2014 from 10am-12.30pm at all District Head Quarters. Eligibility: The Students appearing for SSC March 2014 are eligible to apply online at aprjdc.cgg.gov.in for admission into 2014-15 academic year in APR Jr Colleges (General & Minority). For Boys: 1. Nagarjuna Sagar 2. Kodigenahalli 3. Venkatagiri 4. Gyrampalli 5. Sarvail. For Boys: Guntur, Kurnool, Nizamabad, Hyderabad. MPC., BiPC., MEC., CEC., (Vocational Courses EET & CGT only at Nimmakuru) and at Minority Junior Colleges MPC., BiPC., CEC. Longterm intensive coaching will be given for EAMCET and CACPT at all the above Junior Colleges. Selection of Candidates will be based on Merit in the Entrance Examination considering the community wise reservation and local status of the candidates. The test is of objective type with 2½ hrs duration for 150 marks (50 marks for each subject). The candidates have to mark their answers in the OMR sheets. The question papers of APRJC CET will be based on 10th standard in AP state syllabus for subjects and English will be General English. 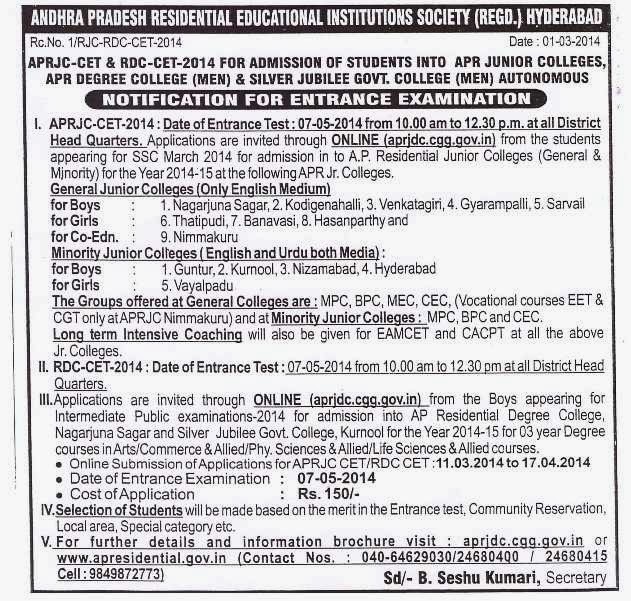 Applications are invited through Online at http://aprjdc.cgg.gov.in from the Boys appearing for Intermediate Public examinations 2014 for admission into AP Residential Degree College Nagarjuna Sagar and Silver Jublie Degree College Kurnool, for the year 2014-15 for 3 Years Degree Courses in Arts/Commer and Applied /Phy Sciences, & Allied/Life Sciences & Allied Courses. Online Submission of Applications for APRJC/APRDC CET is from 11th Mar 2014 to 17th Apr 2014.